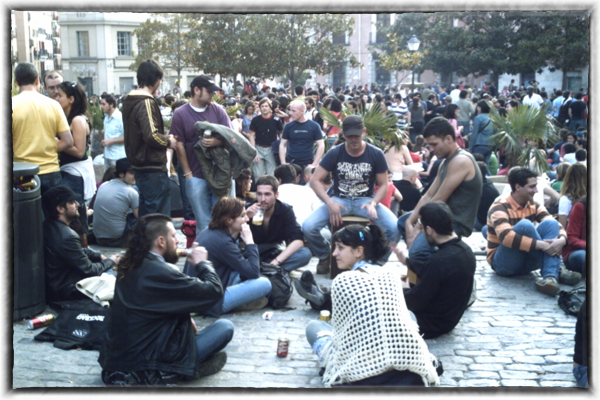 A botellon in Plaza de la Cebada in Madrid. It doesn’t make any difference what kind of wine you use (although the box wine Don Simon, which comes in a Tetra Pak and costs one euro, is hugely popular) but it always calls for Coca-Cola (there’s something about the sweetness and caffeine that makes it the go-to kalimotxo mixer). Here’s how you make a kalimotxo: you get a one-liter drinking glass called minis or cachi or macetas, fill it half way up with red wine and fill the rest of it up with Coca-Cola. If you’re really sophisticated, you can add ice. Voilà! You have a kalimotxo cocktail. You could drink a kalimotxo at home, but nobody does that in Madrid. Instead, you drink it at a botellón. The word itself means “big bottle” (in reference to the liter-sized minis) but refers to the groups of young kids (generally between 15 and 28) who gather in public places all around Madrid (and elsewhere in Spain) to share a kalimotxo or two. 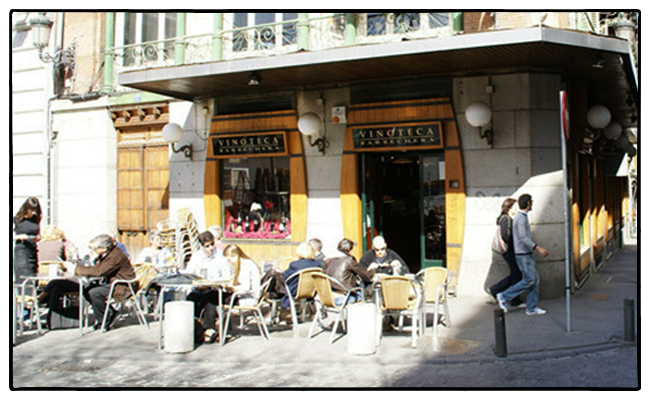 Three very popular places to botellón, particularly in the summer: Plaza de Espana, Plaza de Santa Ana, and Plaza de Dos de Mayo (although every neighborhood in Madrid has its own favorite botellón spot). 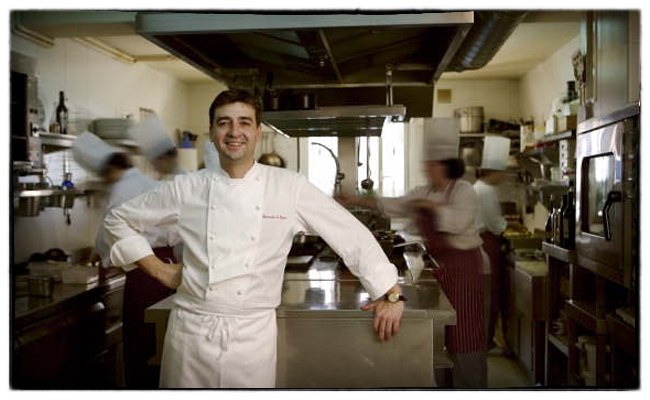 Chef Fernando del Cerro at Casa Jose in Aranjuez. 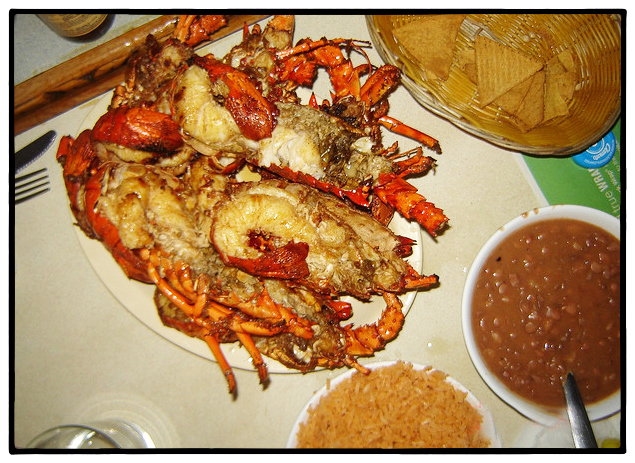 Back in the 1950s, Jose and Maria del Cerro, who lived across the street from the local farmers’ market in Aranjuez, decided to open up a simple little restaurant in their home where they prepared lunches for the farmers, herders, and traders who worked at the market. 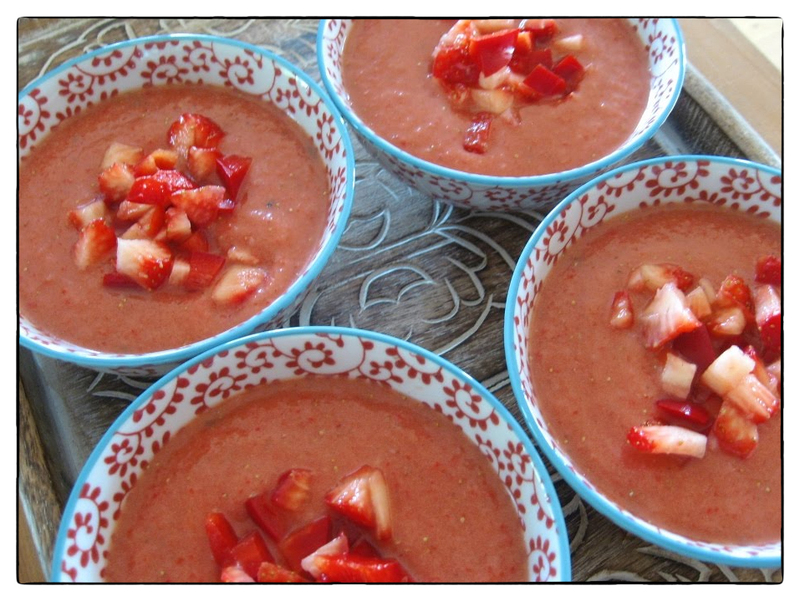 Now, since Aranjuez was known for its produce—artichokes, Brussel sprouts, asparagus, cabbages, celery, strawberries—their menu focused on what was local and what was fresh. The couple had five kids, all of whom helped out at mom and dad’s restaurant. One of the kids, Fernando del Cerro, took a particular interest in cooking. And so in 1991, he reimagined his parent’s modest farmhouse restaurant and opened Casa Jose which, within a year, had earned a Michelin star. Fortunately for us, much of the wonderful local produce was in season. So we had Fernando’s glazed artichoke hearts with sea urchins; baby Brussel sprouts and prune bread wrapped around foie gras and an oyster; paletilla (lower leg) of baby lamb baked with green garlic; and, of course, the local strawberries with a Chantilly cream of roses. 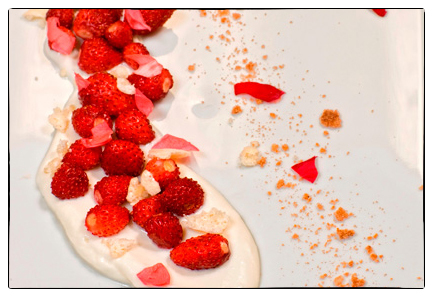 Local Aranjuez strawberries with Chantilly cream of roses. And he was right. The tiny berries were so perfumed, so juicy, and so floral that I would hold each on my tongue and let it just melt in my mouth. An incredible spring treat.